A new kitten is an exciting addition to the family. However, it is important to remember that a new pet brings added responsibilities into your life. Syosset Animal Hospital wants pet owners to be prepared for the many joys and challenges of raising a kitten, helping him or her grow into a healthy and well-adjusted adult. Vaccinations are very important in kittens, whose immune systems are still developing. Young cats must follow a strict vaccination schedule to ensure they are properly protected and develop their immunities. Syosset Animal Hospital offers a complete range of feline vaccinations, as well those specific to New York area diseases. Young animals are constantly growing! Building these new tissues effectively requires specific nutrition. Special kitten-formulated food is energy dense and easy to digest, helping support muscle, bone and organ growth. Syosset Animal Hospital offers dietary counseling and brand recommendations to all of our patients. Contrary to popular belief, cats can be trained. Proper training early on will help keep your kitten on their best behavior when they are older. Around eight weeks of age, begin setting boundaries for your kitten, designating which behaviors are okay and which are unacceptable. Socializing your cat is critical. Consistent, positive interaction will ensure they are comfortable around humans and other cats as they get older. Frequent playtime, petting and grooming helps adjust them to physical contact, while exposing them to new sights, smells and textures will make them less skittish. 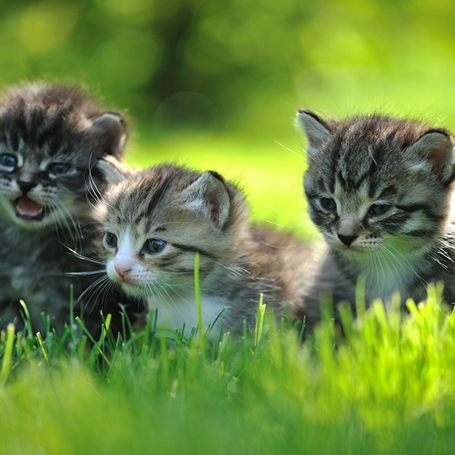 If you have a new kitten, please schedule your first appointment with Syosset Animal Hospital. Our team specializes in early development care, providing the veterinary services and educational resources necessary to raise your new cat. Syosset Animal Hospital looks forward to building a lifelong relationship with you and your pet!